The zombie is a long-lived and beloved movie monster, and also a regular player on cult television. Although originally a zombie was merely “a corpse brought back to life by mystical means” (including voodoo) according to Wikipedia, that definition changed with the advent of George A. Romero’s watershed Night of the Living Dead (1968). Now – largely – zombies are brought back to life by science run amok, or perhaps even by means totally unknown and inexplicable. Originally, zombies weren’t flesh (or brain…) eaters either, but the lumbering, mindless slaves of wizards and warlocks. In film history, zombies have often arrived in narratives that explicitly involve the breakdown of our modern societal infrastructure. These zombies are the mechanism, in other words, which collapse our economy, our technology, and our government. Everything we hold dear is lost. When the zombie apocalypse arrives, the trains no longer run on time. 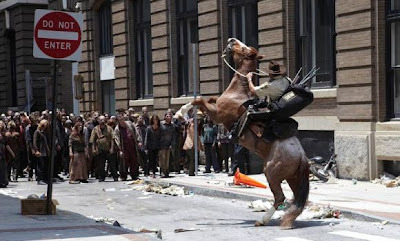 Zombies have seen a tremendous resurgence of popularity in the turbulent last decade, due in part to the many setbacks America has faced -- from war to natural disaster to economic meltdown -- and are the stars of the massively popular The Walking Dead, on AMC. But cult-television zombies have been around for decades, shambling their way into our living rooms and scaring generations of horror fans. In The Twilight Zone’s (1964) “Mr. Garrity and the Graves,” for instance, a town’s worth of zombies rose from the dead to vex the living. In particular, a con-man or “gentleman of commerce,” Jared Garrity (John Dehner), in the Old West of 1890, tells the local townsfolk that he can resurrect their loved ones. As you might guess, that turns out not to be such a terrific idea for Garrity, the living, or the dead. Although not as cerebral as many Outer Limits episodes, this installment remains one of the absolute creepiest of the canon. Ghost Story/Circle of Fear’s (1972) second episode, “The Dead We Leave Behind” is another tremendously spooky zombie show, and it anticipates Stephen King’s similar novel, Pet Sematary, by a full decade. Here, a vengeful mountain forest ranger (Jason Robards) murders his talkative and nagging wife (Stella Stevens) and her illicit lover, and then buries their bodies in his garden shed. Unfortunately, the ranger doesn’t get these corpses into their earthen beds before the first frost comes, and local legends suggest that if you fail to bury bodies before winter’s first freeze, the dead will come back to life wrong, possessed of both life and death. Kolchak: The Night Stalker’s (1974) most terrifying episode, “Zombie,” also featured this famous movie monster. 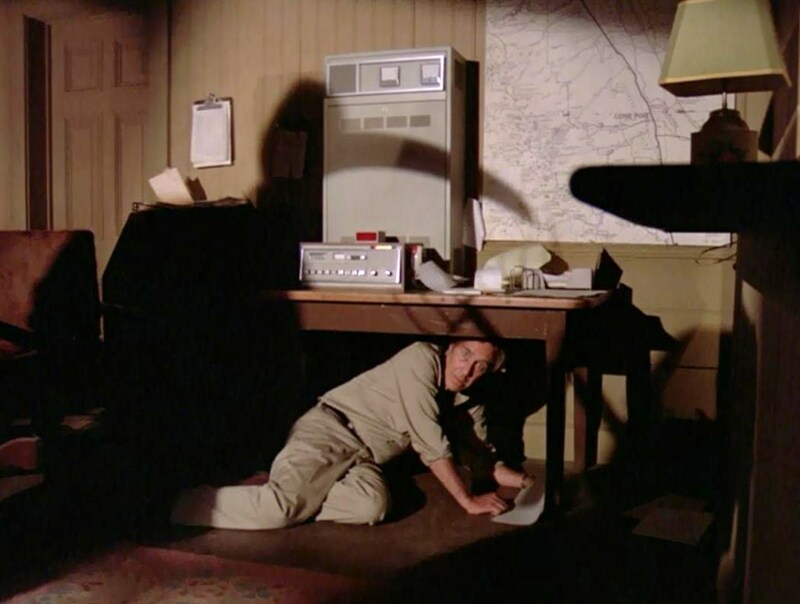 Here, investigative reporter Kolchak (Darren McGavin) investigates a series of killings apparently caused by a zombie. He finds that his living-dead quarry is asleep in an auto-junkyard, and to kill it must pour salt into its mouth, and then sew the lips “very tightly” closed. Kolchak is mid-way through this delicate operation when the dormant monster awakens. Kolchak’s reaction is priceless. The Gerry and Sylvia Anderson space series Space: 1999 (1975 – 1977) often re-purposed horror mythology to depicts its high-tech, mind-blowing adventures. In the Year Two story, “All That Glisters,” Security Chief Tony Verdeschi (Tony Anholt) is killed by sentient silicon life-forms on a distant planet, and becomes an old-school horror zombie, essentially the mindless laborer working for a dark master. At the end of the episode, the re-animated Tony is restored from zombie-hood, but this entire episode of 1999 – often-derided by many fans – faithfully carries on the horror motif from the atmospheric first season. Director Ray Austin deploys tight framing, moody lighting, and a claustrophobic, dim Eagle interior to augment the horror aspects of the life-and-death situation. In 1984, the anthology Tales from The Darkside vetted a more humorous zombie story titled “A Case of the Stubborns.” In this tale, old Grandpa Tolliver (Eddie Bracken) wakes up one morning…dead. But he refuses to believe he has passed away despite all the evidence of his increasingly rotting flesh. Instead, he just goes about business as usual. Although his family attempts to convince Grandpa that it is time for him to move on to the grave, Grandpa is a stubborn sort. Even Reverend Peabody (Brent Spiner) cannot convince the old coot to leave. So it is left to young Jody Tolliver (Christian Slater) -- who loves his grandpa -- to make a case even the most stubborn zombie can’t deny. In the 1990s, the third season of Buffy the Vampire Slayer featured plenty of zombies. In “Dead Man’s Party” a Nigerian mask belonging to Joyce (Kristine Sutherland) begins transforming rowdy party goers, as well as the irritating “Pat” (Nancy Lenehan) into the walking dead. In a later episode that season, “The Zeppo,” the hapless Xander (Nicholas Brendon) falls in with a gang of zombie troublemakers who plan to bomb Sunnydale High. While Buffy and the others try to avert another world-ending apocalypse, Xander must contend with the rebel zombies. 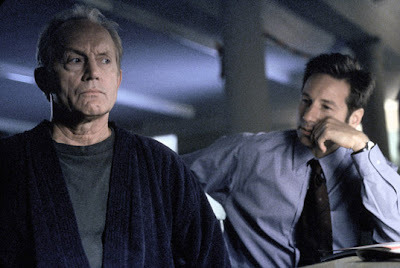 On The X-Files (1999), the crossover episode “Millennium” also featured zombies. Here, Mulder (David Duchovny) and Scully (Gillian Anderson) team up with criminal profiler Frank Black (Lance Henriksen) to undo the Millennium Group’s final, apocalyptic strategy. That strategy apparently involves a necromancer who can bring about the end of the world by creating…zombies. 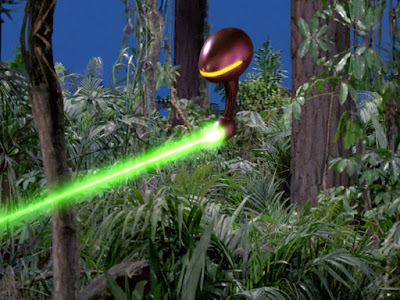 This seventh season episode apparently did not please many long-time fans as a satisfactory resolution to Millennium (1996 – 1999). Yet as an X-Files monster of the week entry (and one featuring a great guest star at that), the episode is very entertaining. The finale -- with Frank Black and Mulder teaming up in a dark basement to shoot zombies -- may not have been what some fans hoped for, but proves visually dynamic and exciting, nonetheless. One of the strangest (and most powerful) zombie stories of recent vintage came about on Showtime’s Masters of Horror. 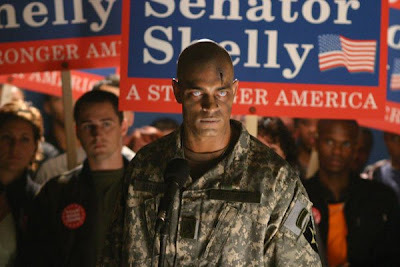 The satirical “Homecoming,” directed by Joe Dante, aired in 2005 and involved an Ann Coulter-like right-wing pundit, Jane Cleaver (Thea Gill) and a presidential speech writer, Murch (Jon Tenney) arguing on TV that the soldiers in Iraq are dying for a good cause. If Murch could bring them back to life, he would, he claimed. And if he did, they would loudly voice their support for the President and for the war effort. In 2010, of course, The Walking Dead arrived and made zombies a weekly fixture on the tube, often to spine-tingling and gory results. 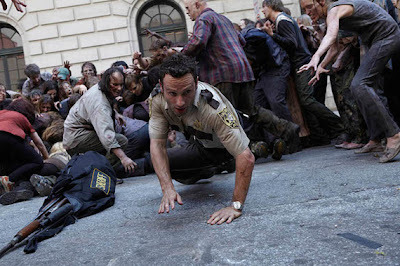 Though the series is not without both detractors and behind-the-scenes turmoil, both seasons have largely gotten the equation right, focusing not on zombies, but on the human response to a world of zombies.